Tagged with U21, Universitas 21. Universitas 21, a global network for research-intensive universities, has released its seventh annual ranking of HE systems. 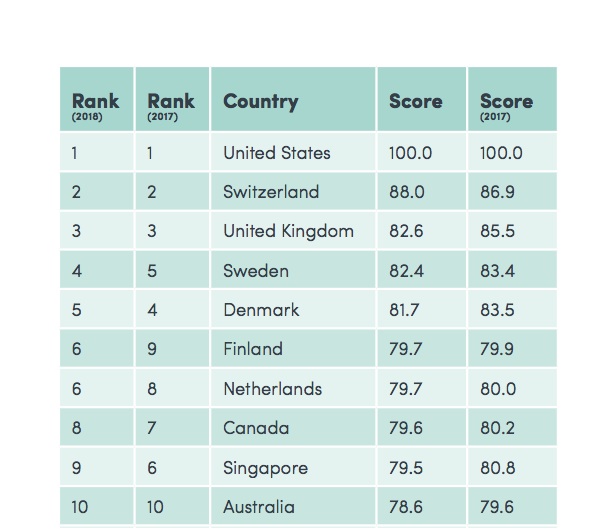 It has revealed that out of 50 countries ranked, the US, Switzerland, the UK, Sweden and Denmark make up the top five. Intended as a benchmark for ‘governments, education institutions, policy-makers and individuals’, the U21 rankings are assessed via a total of 24 indicators covering the areas of expenditure on HE; diversity; government policy, industry links, enrolment rates and research performance. These are summed up under the four headings of Resources, Environment, Connectivity and Output. Lead author Ross Williams of the University of Melbourne said that that the overall picture includes outcomes and specific areas of excellence behind the headline findings. “No one nation is best at everything,” he said. Williams further notes that, over the course of the seven years of U21, improving countries can be more clearly defined. The most improved over this period include China (30), Malaysia (26th), Russia (33rd), Saudi Arabia (23rd), Singapore (9th), and South Africa (37th). The 2018 positions of the above have seen few dramatic changes. Singapore slipped from 6th to 9th and the only change in the top 5 is that Sweden and Denmark have swapped places. Sylvia Schwaag Serger, deputy vice-chancellor, Lund University, Sweden said she is happy to see that Sweden has been highly ranked for several years now. One of the more significant changes this year is the addition of a Research Training category in the rankings, measured by the number of PhD graduates, the income premium earned by those with a graduate degree and the ‘throughput of PhDs relative to the existing stock of researchers in higher education’. The report recognises that the best performing countries are the ones with the highest incomes and notes that “it is neither realistic nor desirable for lower-income countries to match them, at least in the medium term”. To mitigate this, U21 created an ‘auxiliary ranking’ taking into account differences in income levels. Within this ranking, China and SA in top 10 for output, Malaysia is in the top 3 for resources. Summing up, Williams noted that the data can be used to provide insights into how countries can improve its performance in HE.